The American International School of Bucharest (AISB) has started the season of winter celebrations with a series of events that bring forward traditions of each of the many communities represented in school. Around 500 families from 56 countries are invited to celebrate the beauty of diversity while supporting worthy causes. 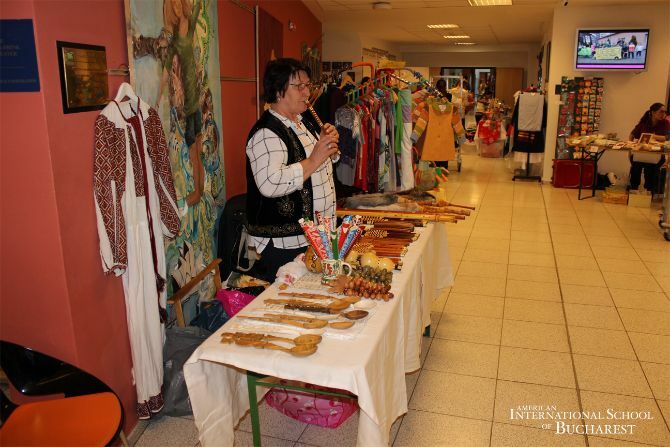 Earlier this week the American International School of Bucharest hosted the Artisans Fair, offering community members the opportunity to share different cultures through wonderful traditional designs, cooking or music. For two days the AISB corridors hosted artisans from Romania (handmade traditional carpets from Suceava County, handmade soaps with natural ingredients from Valenii de Munte, handmade jewelry, Brasov pottery, etc), food from India, South Africa, Israel, Italy, Canadian photographers, French and Pakistani designers and many more. Alongside the artisans several representatives of some non-governmental organizations will attend the Fair in order to sell handmade artefacts made by people supported by these associations. Touched Romania, Second Chance Romania, P.A.V.E.L. Association, Our Lady of Mercy, MIA Studio, Inocenti Foundation, M.A.M.E Association, will also attend the Artisans Fair. The magical Christmas atmosphere continues at AISB with the Festival of Lights. The many religions represented within the AISB community will offer students a wonderful “tour of light”, guided by stories, songs and traditions. Children will all enjoy hearing about the Mexican celebration of La Posada, the Swedish celebration of Santa Lucia, the Indian celebration of Diwali, the Ramadan with its beautiful lanterns, the Italian celebration Presepio, The Israeli Menorah and the tree of wishes, the German Advent candles and will gather under a huge Christmas Tree to listen to stories about Christian traditions. This is one of the many ways in which AISB students are taught about diversity and invited to embrace intercultural understanding. Fabiana Papastefani-Pezzoni, President of the Parent and Teacher Organization says: “Every year we prepare traditional decorations and stories to tell the children who come by every stand. They hear these stories and let their imagination fly into this magical word of light. The school staff (also international) plays different characters. Children love stories, they just love the Festival of Lights”. “All of the events organized at AISB in December are meant to prepare our students as global citizens who appreciate diversity and who are inspired by the beauty that lies in diversity. They are also engaged in projects aimed to help the ones in need, especially at this time of the year. “The Giving Tree” is a very popular project in the AISB community: parents, students and teachers are invited to pick up an ornament that will tell of a child’s Christmas wishes. The presents they bring will go to PAVEL Association, Touched Romania and St. Dimitrie.”, said Catalina Gardescu, Manager of Admissions and External Communications at AISB.